To commemorate the 100-year anniversary of Albert Einstein’s publication of the Theory of Relativity, and the 60th anniversary of his death, a bronze statue of the renowned theoretical physicist was unveiled on Wednesday at the Hebrew University in Jerusalem. The 2.5 meter monument, designed by sculptor Georgy Frangulyan in Moscow, sits on the Edmond J. Safra campus in front of the National Library, next to the departments of mathematics and physics. It is the capital’s second statue dedicated to Einstein, who was one of the university’s founders and most ardent supporters. Indeed, Einstein bequeathed the university his writings, intellectual heritage, and the rights to his image. The first bronze statue was unveiled decades ago and sits in the garden of the Israel Academy of Sciences. The idea for a second statue was conceived by Mark Zilberquit, an author and president of the Heritage Projects and Tchaikovsky International Charity Foundations. “Einstein’s Theory of Relativity was a watershed moment for scientists around the world, and on this anniversary of his achievement, it is a great privilege to recognize him at the Hebrew University, an institution which he so actively supported,” said Zilberquit. Also involved in the sculpture were a number of leaders of Russian and American Jewish communities, including Russian- American philanthropist Leonard Blavatnik, Israeli businessman Aaron Frenkel, and noted pianist Evgeny Kissin. The project was executed in a joint effort by the collaboration of the Israeli Embassy in Moscow, led by Ambassador Dorit Golender, the Israeli Russian Business Council, the Heritage Projects Foundation, the Tchaikovsky International Charity Foundation, and the university itself. 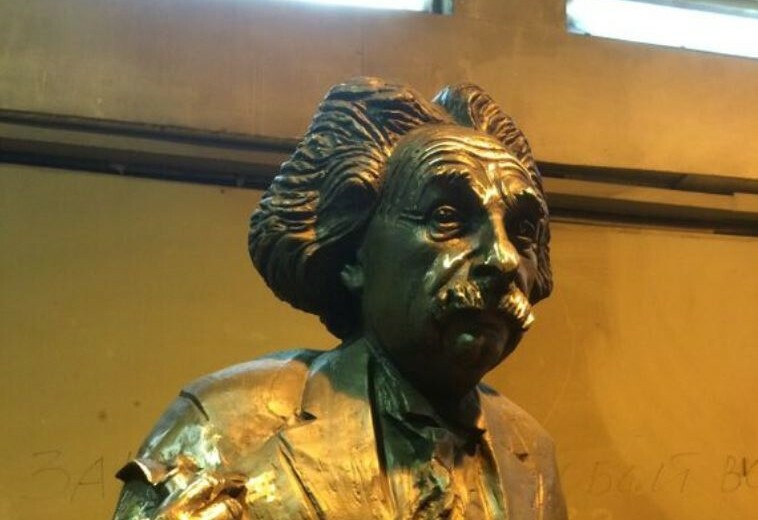 “The unveiling of Albert Einstein’s likeness at this campus is a timely way of celebrating the enduring legacy of one of history’s most impactive personalities, and reminds us how Prof. Einstein’s work has affected everyone at the Hebrew University and around the world,” said Hebrew University president Prof. Menahem Ben-Sasson. “This is a very exciting moment for the scientific community and anyone who appreciates the contributions Einstein made to the academic world,” said Temur Ben-Yehuda, chairman of the Israeli Russian Business Council.